16 Post Speaker Wall Plate for 8 speakers. We have 2 post, 4 post and 8 post 12 post and 14 post available in our store. Designed to work with Bare Wire or Banana Plugs. Precision machined, gold plated binding posts. Gold plated and color-coded for easy identification. Fits standard Double electrical boxes. Put the finishing touch on home theatre and audio/video installations with these high quality audio wall plates. Unique easy to use design utilizes our installer friendly wall plates. 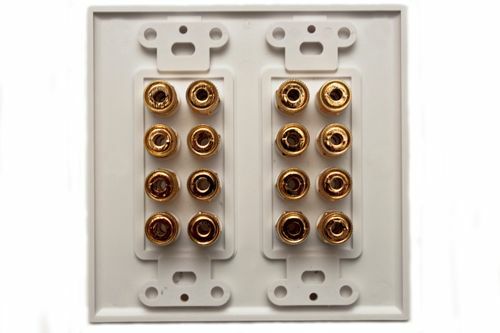 All of our connectors incorporate a hex lock indent to eliminate connector "spin" and are gold plated for maximum conductivity and long life. 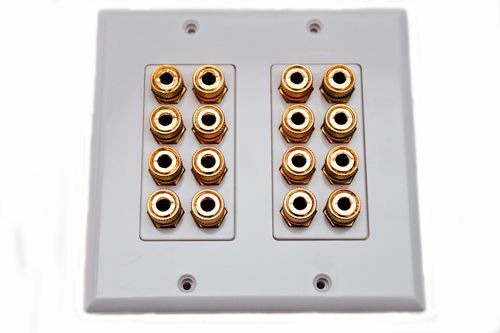 1 Post Speaker Wall Plate for 1 speaker Put the finishing touch on home theatre and audio/video installations with these high quality audio wall plates. Unique easy to use design utilizes our installer friendly wall plates. All of our connectors incorporate a hex lock indent to eliminate connector "spin" and are gold plated for maximum conductivity and long life. All jacks are color coded for polarity identification and are isolated from the plate.